It’s time to Sparkle! 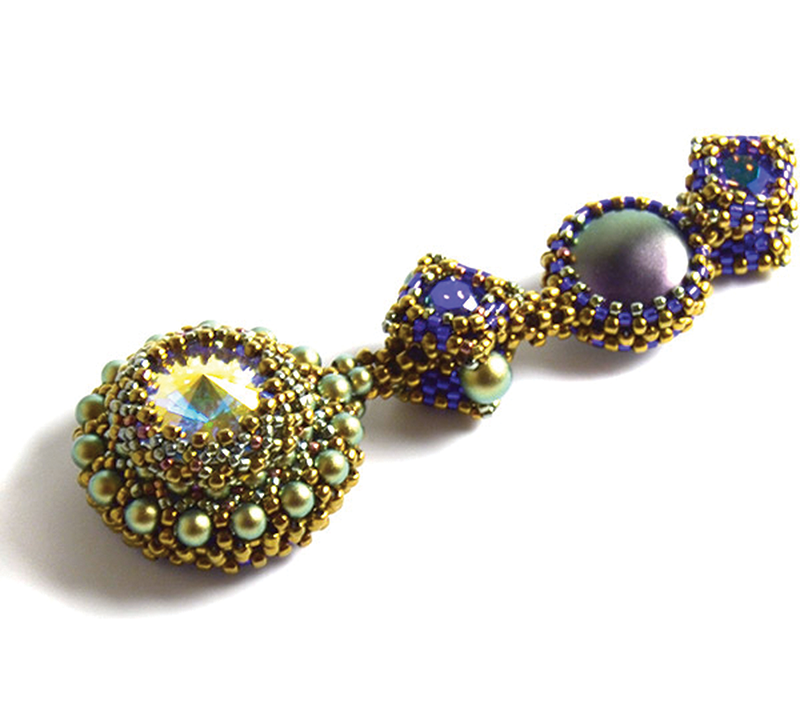 And how better to sparkle than with beading classes with Liisa Turunen. YAY! Liisa has been here several times and she is a total delight. We have so much fun. Join us February 2-4 for three fun days of classes. Pick your day or days and your projects and prepare to be amazed at the pretty things we can make! Liisa designed this sparkly crystal loaded piece for a Metallica concert. It has become her favorite go to piece for even casual events and she rocks it with a t shirt and jeans most the time. 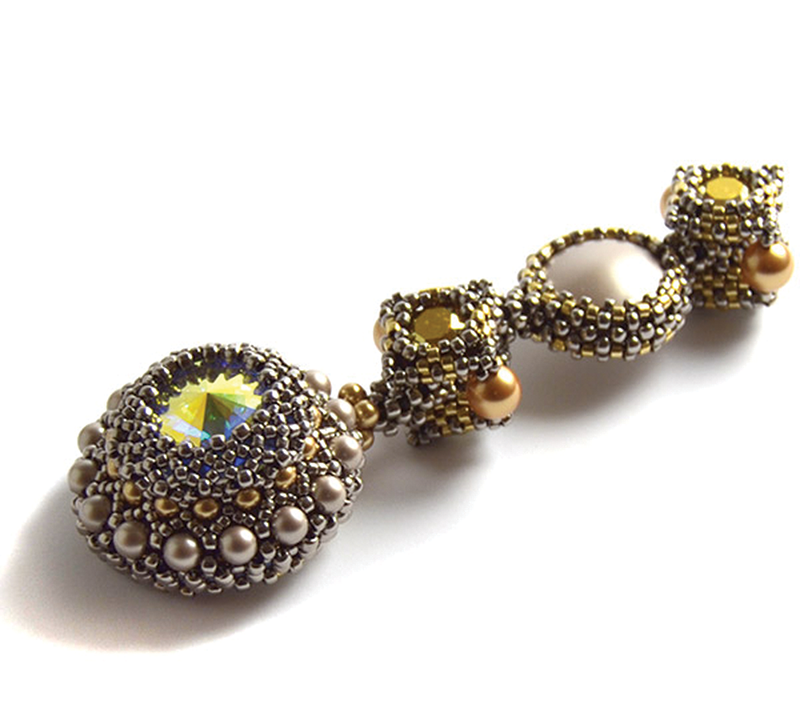 This piece includes a combination of 6 different Swarovski shaped stones ranging from 12mm-33mm. It’s a fun piece that can be made with different layouts; they don’t all have to be big and flashy. You will learn lots of techniques that can be used in future pieces. Class cost is $375 and includes the complete kit, lunch and dessert. 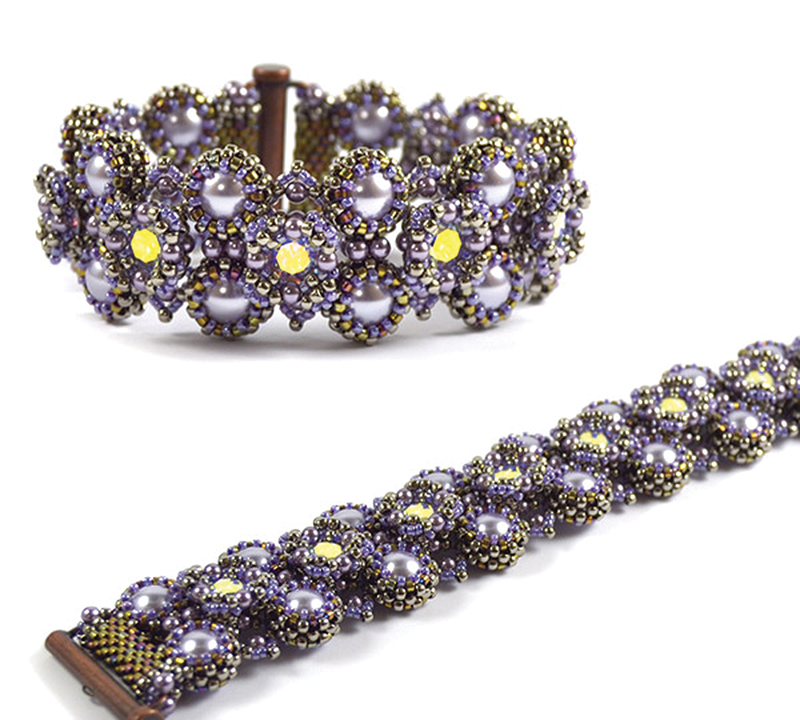 I can never decide which of Liisa’s bracelets is my favorite so you win! 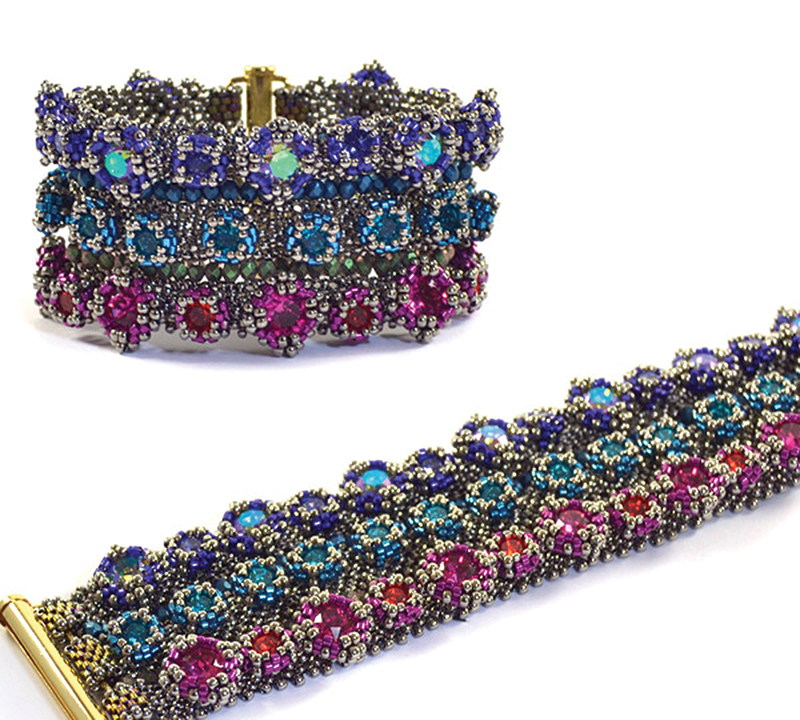 We have Bracelet Bonanza. On Saturday February 3rd, you pick your favorite bracelet. 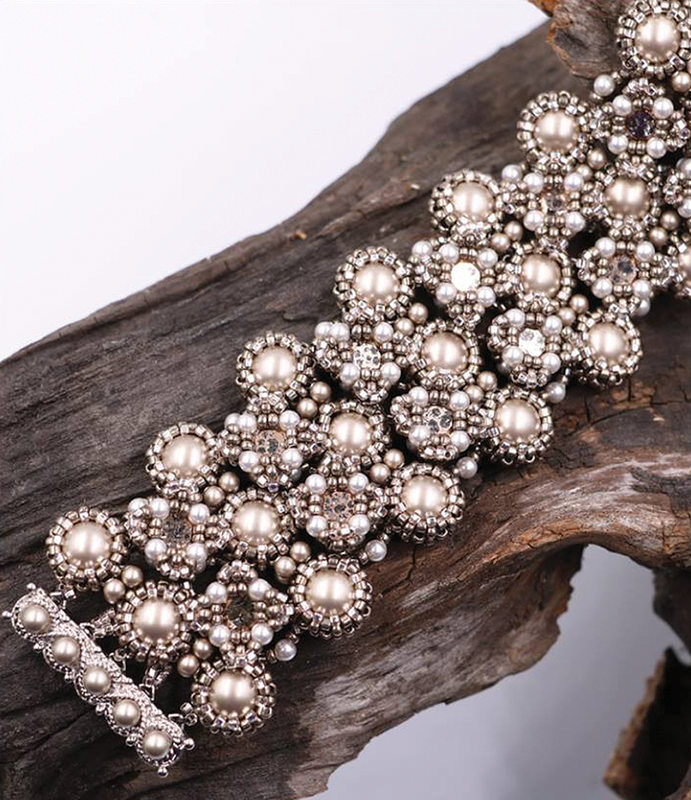 Rows of large pearls encased with bead work create the base of this bracelet. 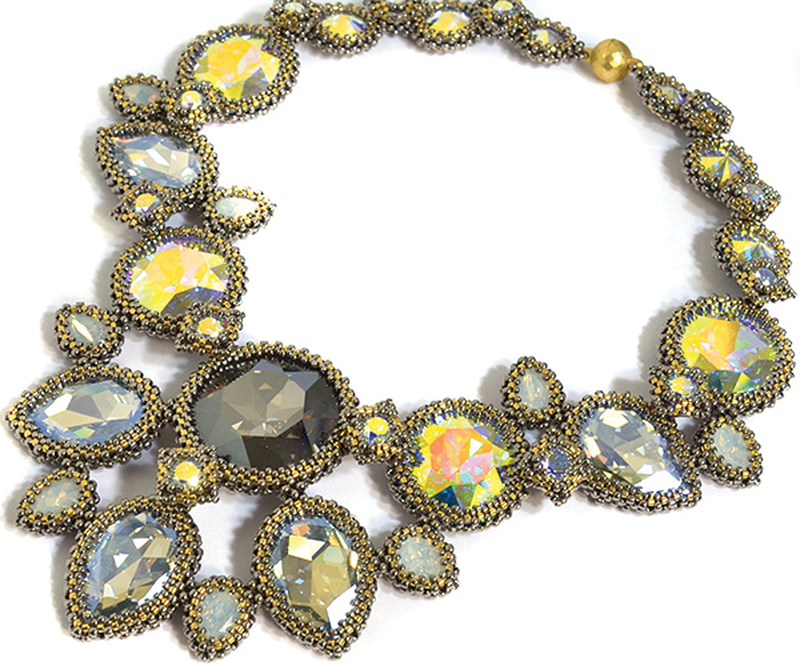 Working in textured layers capture Swarovski chatons for that glitter of light. 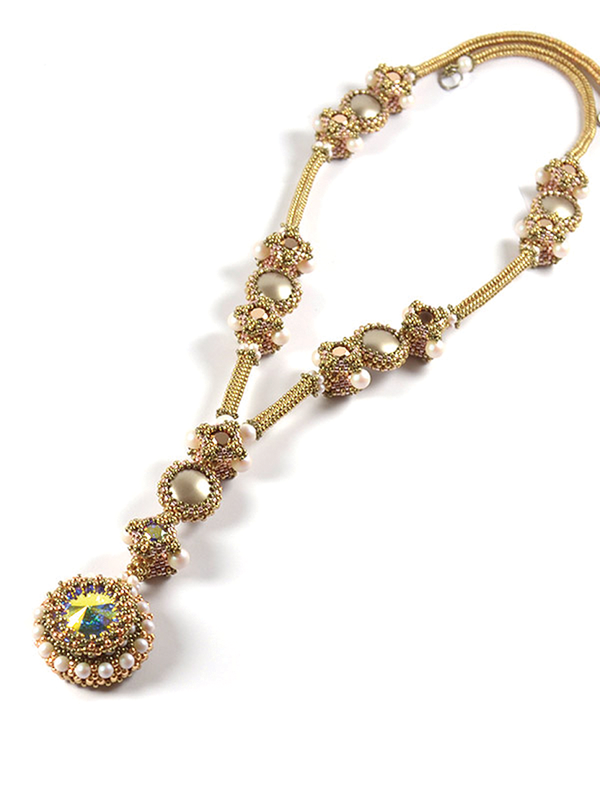 Students will work in a combination of several stitches to encase pearls and create bezels in open sections. This project can be made in 2 rows or the wider 3 rows. Available in 3 colors one pictured and others to come later. 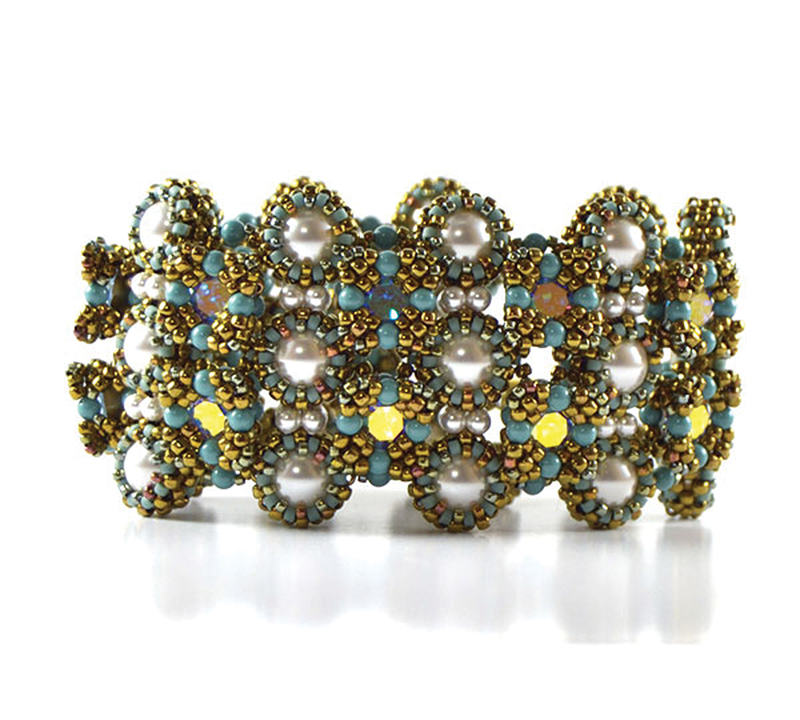 This bracelet is fun to make and fun to wear! Alternating sizes and colors of chatons to create rows of color texture. Work in Right angle weave and peyote stitches. Available in 3 colors. Rose Gold & Gold, Silver & Gold, and Purple & Bronze. The necklace is named “Pallas Necklace” after the Pallas Cat (very funny looking little guy). The project uses a combination of right angle weave, cubic raw, herringbone, netting, and peyote. It is completely reversible so when worn it can roll around and it will always sparkle. It wears long. The larger crystal on the end is reversible as well one side has a 27mm Swarovski rivoli and the other is embellished with pearls and has an 18mm rivoli. This looks like a bunch of components attached but surprisingly a lot of the piece works off of each other and not too much connecting of components. Class cost is $300 and includes the complete kit, lunch and dessert. I hope you can join us for one or more days. We always have such a good time. P.S. We will also have a trunkshow. I’ll be sure to post that on facebook so even if you can’t come you can still join the fun. AND a trunk show!?! Woaaah!